By default, our plugin (both Free and Gold version) doesn’t work on websites hosted on WP Engine who utilizes both Apache and Nginx web server. You will need to create 2 redirect rules as described below. 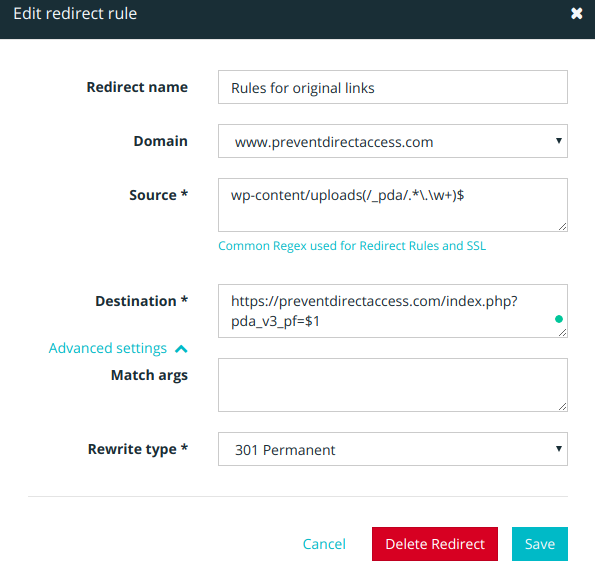 If you’re having trouble setting up these redirect rules on WP Engine, you can just enable this “Keep raw private & original file URLs” settings option for our plugin to be up and running immediately. As a matter of fact, using raw file URLs will speed up “readfile” process as the requests don’t have to go through htaccess and redirect rules anymore. On the minus side, you cannot use pretty permalinks and raw URLs doesn’t look as nice. As always, please make sure you’re using the latest version of our plugin. Feel free to contact us for support if you face any problems or have any questions.